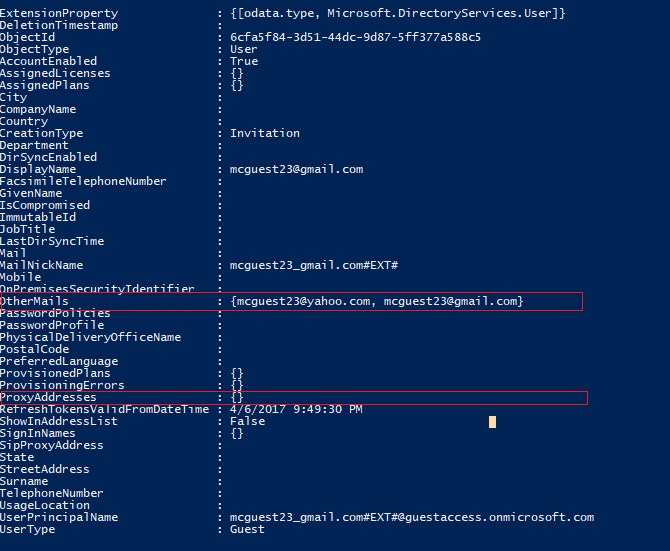 Download and install the Microsoft Azure Active Directory V2 PowerShell Module and the Microsoft Online Services Sign-in Assistant. Run a series of PowerShell commands to pull up the guest user account properties. Repair the guest account configuration. Download and install the 64-bit version of the Microsoft Azure Active Directory V2 PowerShell Module. For more information, see AzureAD. Download and install the 64-bit version of the Microsoft Online Services Sign-in Assistant: Microsoft Online Services Sign-in Assistant for IT Professionals RTW. Connect to Microsoft PowerShell by using your company admin credentials. On the Enter Credentials page, enter your Office 365 global admin credentials. See Assign admin roles in Office 365 for more information about roles in Office 365. Enter the following in the PowerShell window. Press Enter after each command. Look up the invited user and properties based on the email address in OtherMail property. Option 1: Remove the email-address from OtherMail property. This will make OtherMail a single-value property which has the same email address as invited guest email address. Note that when you remove the email address, the user loses access to all SharePoint Online files that had been granted to that address. Option 2: Delete this user and re-add them to the group. Note that when you delete the user, he or she will lose access to all SharePoint Online files that had been granted to that user's email address.